Mary is beginning her 23rd year at LEDP and 13th year as LEDP Director. Mary received her B.A. in Elementary Education and Moderate Special Needs from Curry College in Milton, MA. Since graduating, Mary has taught in a preschool for two years before working as a teacher’s aide for special needs students in the Lawrence School. She spent many years working as an LEDP Pre- K and 4/5/6 teacher. 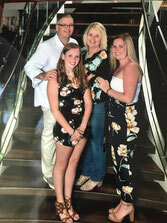 Mary enjoys music, especially John Denver, Irish Step Dancing, watching her children play Lacrosse and Basketball and spending time with her family, especially her husband Paul, and beautiful daughters Lauren and Bridget and dog Chloe. Lauren is 20 and is entering her Sophomore year at Regis College, studying Nursing and Bridget, is almost 16 years old and is a Sophomore in High School. Mary looks forward to another exciting and successful year at LEDP. This is Janet’s 12th year at LEDP and is still loving her job! Janet began her years at LEDP as a teacher and coordinator in 4/5 then 4/5/6. When asked if she would be willing to move to 2/3, she did so with a little reluctance, but easily made the transition. When configurations in LEDP changed, Janet was coordinator for 3rd grade and assistant director for 2 years. This year Janet will be full time Assistant Director and is looking forward to the challenge and the opportunity to work with all groups when needed. Prior to LEDP, Janet worked with the reading specialists at Lawrence School in grades K-6 for twenty years. She also was director of After Hours U for two years at Lawrence at Lincoln and was an activities assistant at the Goddard House Alzheimer’s Unit. In 2005, after her husbands’ passing, she established and was President of a 501(3)C organization raising funds for brain cancer research at Dana Farber Cancer Institute. In her free time, Janet enjoys reading, spending time at the beach and spoiling her granddaughter’s Drew and Milly. Janet is excited about her new position and is looking forward to working with all LEDP families! Donna is so pleased to begin her 2nd year at LEDP. Prior to joining LEDP, Donna worked at the West Roxbury Community Center for 8 years. She started as an instructor/coordinator for a toddler art program for 3 years, followed by 5 years as a teacher in the Small Wonders Early Education Program for 3 and 4 year olds. Donna and her husband Peter are both Brookline natives (educated at Pierce, Lawrence and Brookline High.) She has a special place in her heart for Brookline, and is thrilled to be back "home". They are proud parents of 3 daughters, Erin (20), Bridget (18) and Kate (16). Their home is a lot quieter (and cleaner) now that 2 out of 3 daughters are away at college! Outside of LEDP, Donna enjoys watching her daughters pursue their individual passions which include art, musical theatre, softball and dance. Through the years of raising her daughters, being involved in their school was very important. She also enjoys travel, baking, and trying new restaurants. This is Emilia’s first year in LEDP. She is an avid comic book collector, botanist, and sushi enthusiast. Before discovering her passion for teaching, she earned her BFA at the Maine College of Art majoring in sculpture and literature. She primarily worked in welding and bronze casting but also really enjoyed glass blowing and printmaking. Being a visual learner, she understands the importance of art as a medium for teaching and reaching out to children. Creativity is a valuable way to communicate with kids and she is thrilled to be a part of the LEDP team! This is Nerissa's first year at LEDP. Nerissa has a Bachelor's in Psychology from Saint Augustine's University in Raliegh NC and is 10 classes away from receiving her Master's from University Of Phoenix for Psychology as well. She has worked with children for 7 years from grades K through 12 between Boston & North Carolina . Boston center for youth and families,Loaves & fishes ministries, Kindercare, Brookline/Brighton JCC just to name a few. Nerissa is also a Brookline native where she attended Lawrence school until fifth grade and finished at Pierce School sixth through eighth grade and graduated from Brookline high in 2009. Also she is a mother of a five year old son Tyler and an eleven month old son Quillan. In her spare time she enjoys singing, dancing,painting,traveling,and most importantly spending quality time with her family and close friends.Her love and Passion for Teaching kids are out of this world. Nerissa is looking forward to her first new exciting year working with the K team and all the LEDP families!!! Karen is happy to be returning to LEDP for a 12th year. She enjoys doing many activities with 1st graders. In her spare time, Karen likes reading, exercising, and exploring Boston. She is looking forward to a great year with the returning kids and getting to know the new kids too! Jackie is excited to be returning to LEDP. This will be her eighth year in the 1st grade group, but she worked with our Pre-K children four years ago as well! Jackie is certified in Early Childhood Development and has graduated and holds a Associates Degree in Early Childhood Development. Jackie has three children and 2 dogs named Neko and Olaf! She enjoys the summer months and is looking forward to this school year working with your children! Kelly is excited to start her second year at LEDP and her first year as coordinator for the 2nd grade group! She has a bachelor's degree in Mathematics with a minor in Teacher Education from Wellesley College. She has also worked in the past as a student-teacher, a substitute teacher, and a City Year corps member. In her free time, Kelly enjoys reading, biking, and playing and watching soccer. When she’s not at LEDP, she also loves spending time with her dog Kona. Nate is really excited to begin his first year at LEDP. He has a Bachelor’s degree in Fine Arts from Alfred University. Before coming here to LEDP, Nate worked as a substitute and paraprofessional in the Brookline public schools. In his free time Nate enjoys reading, making pottery, practicing Brazilian Jiu-Jitsu, and traveling. He’s looking forward to working with LEDP 2nd grade this year. This is Alicia's fifth year working with LEDP. Alicia has a degree in Human Development and a Master's degree in Social Work both from Boston College. Alicia worked as a one-on-one aide at Lincoln-Eliot in Newton for a year and worked as an assistant teacher at the Italian Home for Children School in Jamaica Plain for 7 years. During her free time Alicia enjoys working out, traveling, reading, going to the beach, and spending time with her family and friends. Alicia is excited to be working with Tatianna and Chris for another year as 3rd Grade Coordinator and to start her fifth year with LEDP! Mr. Chris has returned for year two, with grade three. Assembled again with the hippest of teams. More sun and more travel is the mantra this year. Following curiosities, as well as overcoming fears. Learning new skills, while honing the old. Excited to see how this year unfolds. This is Tatianna’s second year with LEDP and she’s excited to be moving up with her team to third grade this year. Tatianna has worked in education for about eight years from high school into adulthood. She loves painting, drawing and designing. She’s most proud of successfully completing 1700 hours of service with City Year Boston serving with the Henry Grew Elementary School in Hyde Park in 2016. She is looking forward to learning, growing and exploring along side the LEDP team and students. This is Irene’s 8th year working with LEDP! She also runs the Peer Mentoring Program in LEDP! Please, feel free to chat with her anytime with questions- she loves talking about her mentors! She previously worked at the Chestnut Hill After-School Program and currently works at their Creative Arts and Sports Program in the summer as their Lower Camp Division director. She graduated from Emmanuel College with a B.A. in Psychology with a minor in Sociology and was an assistant track and field coach for five years. In her free time she loves listening to music, reading and really doing anything active! Irene is also a massive Celtics fan! Go C's! Having previously worked with the K/1 group, Irene is excited to continue working with the 4/5/6 group! This is Sam’s second year at LEDP. Originally from Manchester, NH, Sam has been working with children in Boston and Brookline since 2009. He joined City Year Boston just after high school and worked at a YMCA summer camp and afterschool program while he studied Elementary Education and Philosophy at Wheelock College. After college, Sam worked at the YMCA as an Out-of-School-Time Director for an afterschool program at the Haley Pilot School in Roslindale and Camp Ponkapoag in Hyde Park. Outside of work, Sam is the kind of person who takes on more hobbies than he has time for. He plays guitar in a kid-friendly punk rock band, participates in the Society for Creative Anachronism, and plays nerdy tabletop roleplaying and board games. Sam is very excited to return to LEDP this year, and looks forward to continue leading the Nerd Club with our older students! Bianca is excited to be returning to 4/5/6 this year. In the morning, she works at the Lincoln School in Melrose as a Reading Tutor with younger children. Also, from 2014-2016, she worked as a paraprofessional at the Lawrence School. Bianca graduated from Merrimack College with her M.Ed in Moderate Disabilities, and has a B.A. in English Language & Literature from Southern New Hampshire University. In her spare time, she enjoys working out, reading, listening to music, and playing guitar. Bianca looks forward to working with returning 4/5/6 kids, and the new 4th graders!